Art Kleiner submitted this Mystery Foto of a 1910 Lake Ronkonkoma postcard. It promoted the Motor Parkway as "connecting with New York City by highway for the exclusive use of automobiles." -What was the M.G. Babcock Company? A local real estate company that marketed summer cottages and land to potential customers in Brooklyn and Queens. -Identify the building featured on the postcard. The home of Mr. and Mrs. Arthur Von Osterman, located on the southeast corner of Rosevale Avenue and Portion Road in Lake Ronkonkoma. -Was the Long Island Motor Parkway ever officially called the "Vanderbilt Motor Parkway" in 1910? The parkway was never officially called the Vanderbilt Motor Parkway when it was open from 1908 to 1938. This postcard is the earliest reference to a variation of its nickname "Vanderbilt's Motor Parkway." "This 1910 Colorized postcard was created by the M.G. Babcock co. They were a local real estate company that sold small summer cottage type houses and plots of land. Their main marketing target was Brooklyn and Queens. They would develop a small area of homes and then give that area a fancy name for marketing purposes. one area for example they named Ronkonkoma Heights. Some locals still proudly call these areas by those names today!" Congrats to Steve Lucas who correctly answered all three Mystery Foto questions. Thanks Art for the submission and Dale for the insight. If you have a suggested Mystery Foto, please send a jpeg to Howard@Kroplick.com . The earliest known printed reference to "Vanderbilt Motor Parkway." The Von Osterman house was featured on the flyer. TThe Petit Trianon and the Motor Parkway Terminus were attractions for the area. "in 1917 this piece of land was owned by Theodore Madden. It was not divided into separate lots, and Myers Ave. did not exist. The Lake Ronkonkoma Heights section from this 1925 survey seems to have been owned and marketed by the Lincoln Realty Co. This company was owned by Robert P. Lincoln, and their office was located at the corner of Rosevale Ave. and Portion Rd. Right on the spot were the Von Osterman house once stood. This info about the Lincoln Realty co. marketing that lot is not confirmed yet, but at this point in my research, they appear to be the marketing company for that area." MY computer is down,so I can’t research this one. I’m at the library doing this right know,this is a very interesting one too. Well good luck guys,it would take me too long here to do it. That looks like the Von Osterman house which was located near the north-west corner of the lake. Today the property is occupied by a beer & soda distributor at the south-east corner of Rosevale Ave. and Smithtown Ave. 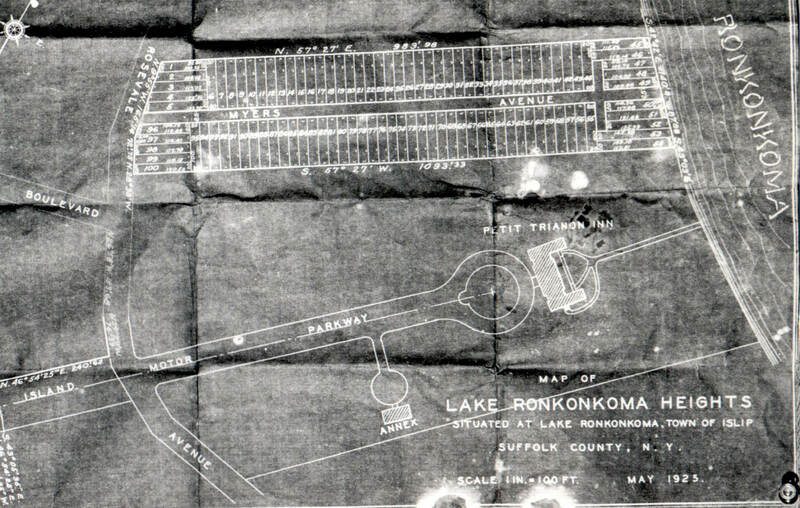 The M. G. Babcock Co. was one of many real estate development companies that promoted and sold land around the Lake Ronkonkoma area in the 1910’s and 1920’s. 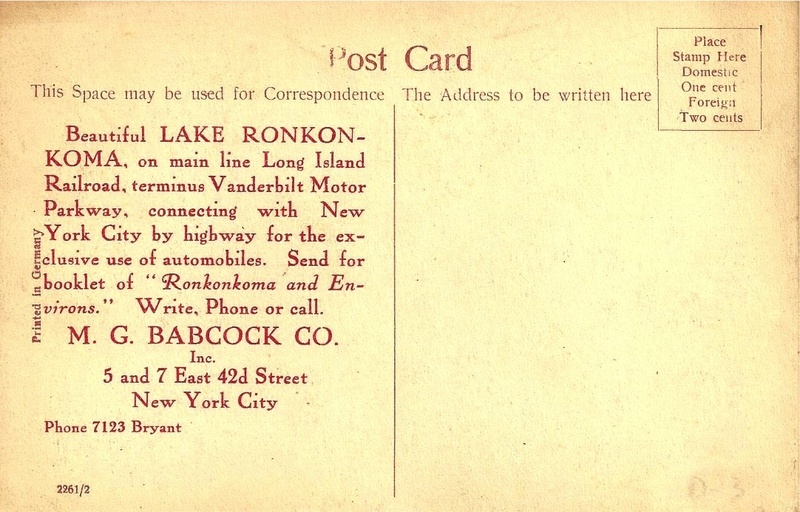 I don’t think the LIMP was ever officially called the Vanderbilt Motor Parkway although it obviously was referred to as such on the postcard and probably other publications as well. I learned ALOT about Ronkonkoma and it’s history this weekend, but it wasn’t enough to solve all the questions! One of many NYC real estate brokers selling large vacation homes to the NYC wealthy at that time. Unknown. Looked at dozens of historic homes, hotels, pavillions, 1930 aerials and couldn’t find a match. Possibly the postcard is just a generic M.G. Babcock sales brochure of sorts for their estates that are for sale in the area? -Was the Long Island Motor Parkway ever officially called the “Vanderbilt Motor Parkway” in 1910? I always understood it was never ‘officially’ called the ‘Vanderbilt Motor Parkway’ at any time and any reference to it as such was incorrect. On a side note; I did find the exact postcard for sale on Ebay if anyone is interested!